Rainforests are home to more than half of the Earth’s plants and animals. With such a diverse array of animals, each layer of the rainforest teems with thousands of unique species. The shrub layer, where saplings and shrubs grow close to the forest floor, is home to large, predatory cats, millions of insects and a wealth of reptiles. Many of the rainforest’s top predators patrol the rain forest floor and shrub layer. One of the most fierce, the jaguar (Panther onca), can weigh as much as 300 pounds and is a master of camouflage, stealth and speed. Quiet on the ground, these big cats stalk and ambush their prey (armadillos, peccaries, capybara, tapir, deer, squirrels, birds and even snails and turtles) often climbing trees to do so. Many primates also live in and around the shrub layer. These include the tailless species like gorillas, bonobos and chimpanzees. Grasshoppers, spiders, scorpions, caterpillars, beetles and even wasps make their home in the shrub layer. One such insect, the titan beetle (Titanus giganteus), is the largest beetle in the world. The largest recorded specimen measured almost 7 inches long. These beetles feed on larvae and decaying wood in the rainforest shrub layer and are capable of both flying and loud hissing. Snakes and lizards all but rule the rainforest floor and shrub layers. From the predatory boa constrictor to color-changing chameleon, this group makes up a large percentage of shrub-layer animals; only insects have larger numbers. Green anacondas (Eunectes murinus), though semi-aquatic, ambush prey such as birds, small mammals and amphibians in the ground and shrub layers. Geckos and chameleons hide in logs, decaying vegetation and small shrubs, changing colors to camouflage, defend territory and communicate with mates. Most of the birds on the rainforest floor and shrub layer are insect eaters. Multicolored peacocks (Pavo cristatus) are social birds who prefer to live in large flocks. They share the rainforest layer with junglefowls, bowerbirds and cassowaries. 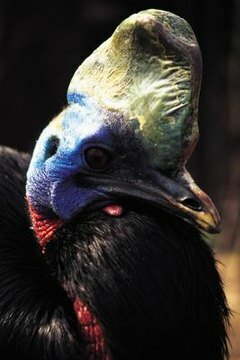 Cassowaries are the largest rainforest-dwelling ground bird in the world and can grow to 40 inches tall. They’re quick, agile birds; cassowaries can run at speeds of up to 30 miles per hour.